While scouting around HOUZZ.com, (which if you have never heard of it, you definitely need to check it out, it’s my #1 go to site for inspiration! ), for a nice photo of roman shades, I came across these flat roman shades in plaid fabric. Looking at them I realized how little my customers have requested plaid and how even less I have suggested plaid fabrics over the last several years. Was plaid coming back? Should I be re-thinking this versatile little pattern? I wondered, so I decided to do a little recon work and this is what I discovered. 1. Plaids and checks are still predominantly used in traditional settings, although I did find the occasional transitional room featuring them. 2. I found that used right, plaids and checks will punch up a room for a striking effect, especially a commanding, large-scale plaid. 3. I discovered that designers from DC to the UK are utilizing plaid with success, creating a compelling case for the revival of plaids and checks; see if one of them inspires you! This big box plaid partners so well with the floral damask on the furniture because the color is tonally spot on and the scale of the two compliment each other perfectly. Notice how Mary Douglas Drysdale rounded out this inviting living room with a larger scale medallion pattern area rug and a smaller scale plaid on the toss pillow, keeping everything in the same sunny yellow color palette. Bonus tip: The touches of greenery pop the room giving it a super fresh feeling! Cozy, warm, soothing, these adjectives swirl around my mind looking at this country style bedroom designed by Wellborn & Wright. The muted robin’s egg blue and chestnut brown on the bedding and window treatments create a relaxing, tranquil bedroom. The flat roman shade on the window and a pleated drape on the sliding door, both with black out lining, combine function and beauty perfectly for each application. The inside mount roman leaves the stained accent molding visible and moves up and down as the window does while the drape moves side to side giving easy access to the door. Bonus Tip: You should never be afraid to mix shades and drapes especially when it serves a practical use. 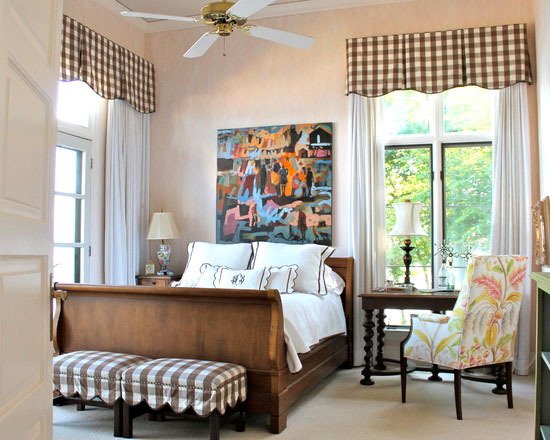 In this guest bedroom vivid plaid valances are unexpected but noteworthy. The plaid invites us in; it says “be comfortable in this beautiful space”. Picture substituting the plaid for solid linen, the room would translate toward modern or if with a large floral, the room would become formal, loud even. The plaid, expertly selected by interior designer Lauren Mikus, prevents the room from taking itself too seriously. Bonus Tip: Installing the window treatments well above the transom windows gives the room height and allows more light to fill the room. 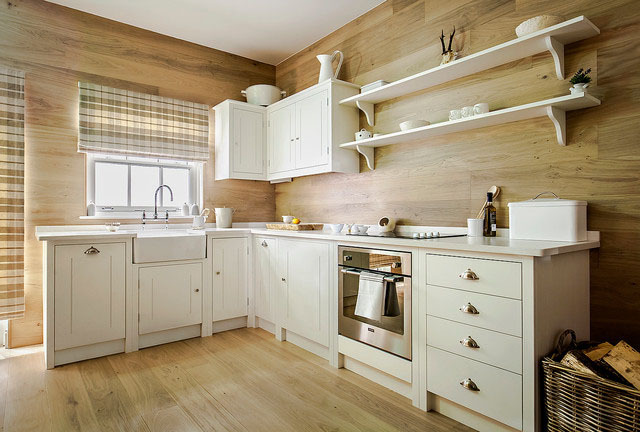 The design elements in this kitchen by British Standard threw me a curve. At first glance the mood is clean and modern. But when you explore the details you find the contradictions. The open shelves are minimalist but the brackets are traditional, the cabinets are sleek but the hardware, sink and faucets are country, the monochromatic color theme is contemporary but the accessories are homespun. And, of course, there is the plaid roman shade, the final component that defines and pulls the kitchen together. This is unexpected, artful design. Nicely done. Bonus Tip: The roman shade is correctly installed well above the window at a height even with cabinet line.